In this tutorial, we are going to discuss how to get current page URL using PHP. $_SERVER is a super global variable, which is always available in all scopes. We will use $_SERVER variable to get the current page URL. It is an array contains various information such as, headers, document path, script location, request method etc. $_SERVER['HTTP_HOST'] : Contents of the Host header from the current request, if there is one. $_SERVER['PHP_SELF'] : The filename of the currently executing script, relative to the document root. For instance, $_SERVER['PHP_SELF'] in a script at the address http://skptricks.com/post/php-tutorial.php would be /post/php-tutorial.php. $_SERVER['QUERY_STRING'] : If a page is accessed via any query string, $_SERVER['QUERY_STRING'] fetches that query string.This is a actual URL http://localhost/skptricks/check current page url/currentPageURL.php?jj=kkkk after the $_SERVER['QUERY_STRING'] operation would be jj=kkkk . 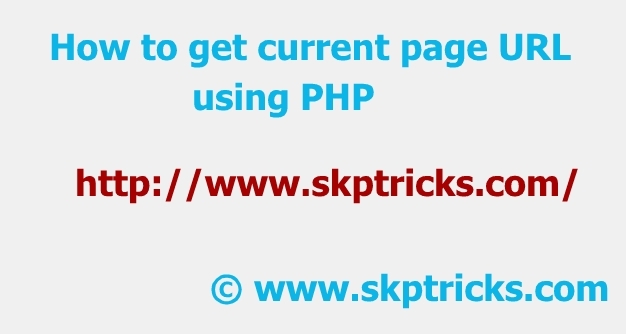 Lets see the following simple PHP function with help of that you can get the current page URL with or without the query string as per your need. This is all about fetching current page URL using PHP. Hope you like this simple example. Thank you for reading this article, and if you have any problem, have a another better useful solution about this article, please write message in the comment section.